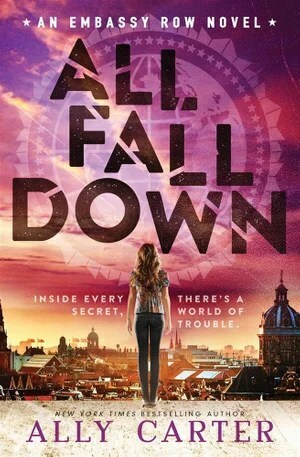 All Fall Down is the first in the Embassy Row series from Ally Carter, author of the Gallagher Girls and the Heist Society books. This was my first encounter with Carter as her former books’ premises did not seem to engage me. I have since reconsidered my position on that and have added the Heist Society series to my to-read list. I recently rekindled my love for young adult contemporary thrillers with Sarah Alderson’s Conspiracy Girl and James Patterson’s Confessions series (reviews coming soon), so when I came across All Fall Down, I did not blink before hauling it into my non-virtual shopping basket. That’s right! It is my first physical read in what felt like eons! The fact that it was available at my local Big W in a gorgeous hardback at a great price helped. All Fall Down is the story of Grace Blakely, a 16-year-old army brat/serial troublemaker, sent to live with her grandfather, a US ambassador stationed in Adria. The relocation follows the death of Grace’s mother, which Grace does not come to terms with quite well, insisting it was murder when people around her insist it was an accident. The US Embassy resides at Embassy Row adjacent to all the other embassies. Immediately upon arrival Grace learns that the place operates under strict if not practical rules of conduct and that a slight deviation can result in an international incident, ranging from collapse of fragile national ties to war! As if that is not enough, she discovers that her older brother has tasked his once best friend and boy next door Alexei (son of the Russian ambassador) to keep an eye on Grace, much to her annoyance. She also reluctantly forms a friendship with Noah, son of the now divorced Israeli and Brazilian ambassadors, Rose (Germany) and Megan, daughter of a CIA operative working for the US Embassy. Things turn from bad to worse when Grace spots the man she believes killed her mother in Adria and embarks on a mission to find him and make him pay thus proving to those around her that she is not crazy. Grace is a great character to root for. She is deeply broken but is stoic to a fault. She is also quite witty and sarcastic, so it was great fun to see her interactions with the secondary cast of characters. The secondary cast of characters, with the exception of Alexei, are very well developed. Noah easily became my favourite as the adorkable best friend a la Xander Harris. Meagan and Rose came a close second. The political backdrop for the story was refreshing and gave the mystery that tension that is exclusive to political thrillers. Also, it was a great departure from First Daughter/Chasing Liberty type of storylines, which is as political as YA gets. Finally, I did not see the big twist coming! After sitting through countless seasons of Law and Order: SVU, Bones, Criminal Minds, NCIS and other crime procedurals, I can easily predict 90% percent of mystery-thrillers but Ms Carter sits firmly in the 10%. As if that was not enough to tarnish my ego, she ended it on a pretty good cliffhanger as well. I felt that after a while, Carter tended to repeat herself. Grace does are lot of tailing, and exploring hidden tunnels and this takes up a good chunk of the book to little to no avail. All major plot twists happen in the final two or three chapters, slightly rushed and to an extent, incomplete. While I appreciate the need for cliffhangers as incentive to make readers invest in the forthcoming installments, I did not care for such a big revelation to be dealt with so loosely. Secondly, Alexei, who was given a prime spot in the blurb and introduced to me almost simultaneously as Grace, disappears for 80% of the book. I found this to be entirely contradictory of the character because he was charged with being Grace’s bodyguard of sorts and the guy is not even there to do so. He is also clearly the love interest so the disappearing act was doubly disappointing because how is one supposed to be interested enough to love him when he is absent all the time. I believe it is premature to denote the book’s cons as ugly because at the end of the day it is only the first book of the series and I trust Ms Carter will aptly deal with inefficiencies outlined above in the second book. In conclusion, All Fall Down was a refreshing read with great twists and turns and a strong female lead at the centre of it all. It has set a solid foundation for its future installments so I am eager to see what it develops into. Needless to say my expectations are running high.